Joe West will call his 3rd All-Star Game. 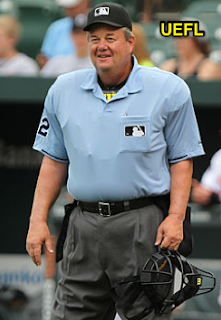 HP Umpire Joe West (crew chief): 3rd All-Star Game. 1B Umpire Angel Hernandez: 3rd All-Star Game. 2B Umpire Mark Carlson: 2nd All-Star Game. 3B Umpire Chris Conroy: 1st All-Star Game. LF Umpire Manny Gonzalez: 1st All-Star Game. RF Umpire Mike Estabrook: 1st All-Star Game. Replay Official Doug Eddings: 1st ASG Replay. Joe West: 11th (.750), 9/12. Angel Hernandez: 60th (.400), 4/10. Mark Carlson: 34th (.583), 7/12. Chris Conroy: 65th (.333), 4/12. Manny Gonzalez: 73rd (.300), 3/10. Mike Estabrook: 35th (.571), 4/7. Doug Eddings: 35th (.571), 8/14. Pursuant to UEFL Rule 2-2-a, all All-Star Game umpires will receive one League point for appearing in the contest (two for the crew chief). No points are awarded to the Replay Official (must "appear in that game"). HP Umpire: Nick Mahrley (Pacific Coast League). 1B Umpire: Nic Lentz (International League). 2B Umpire: Billy Cunha (Pacific Coast League). 3B Umpire: Jeremy Riggs (International League). HP Umpire: Nate Tomlinson (Texas League). 1B Umpire: Eric Bacchus (Eastern League). 2B Umpire: Jason Starkovich (Pacific Coast League [began season in the Southern League]). 3B Umpire: Skyler Shown (Southern League).